The care that Hunt characteristically lavished upon his works appears in such fully finished preparatory studies. It also led him to design or himself create elaborate furnishings, fittings, and models because he believed that nature's infinite variety demanded the painter work from life. 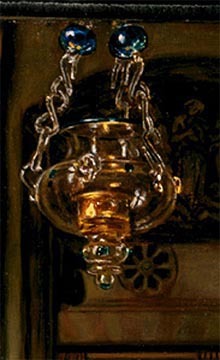 For example, like the lantern in The Light of the World and both the two bas reliefs and the candlebrum in The Lady of Shalott, Isabella's elaborate majolica vase was created by Hunt as a model from which to paint (see Cracroft, Bennett, and Tate no. 138). Like The Lady of Shalott, Isabella also took form many years after the artist first encountered the subject, and also like his last major work, it derives from an earlier PRB illustrative projectÑeven though in this case it exemplifies a return, not to one of his own subjects, but to that of a Pre-Raphaelite brother. Although painted long after the dissolution of the PRB, Isabella and the Pot of Basil nonetheless embodies several important characteristics of early PRB work, one of which is that the young would-be art revolutionaries, who often worked cooperatively and even occasionally painted on one another's canvases, developed subjects together. Furthermore, like so many early Pre-Raphaelite and associated works, this one from Hunt's later career depicts tragic love. In illustrating the works of Dante, Shakespeare, Keats, Tennyson, Patmore, and others, as well as in creating their own subjects, the young artists produced a typology of romantic love that includes all its moments from first love to romantic despair and death. Isabella and the Pot of Basil also reminds us how frequently Hunt and his Pre-Raphaelite associates conceived of their works as implied pairs and members of series. Such pairing and seriation, which occurs frequently throughout Hunt's career, appears variously in The Light of the World (1853) and The Awakening Conscience (1853), The Lady of Shalott and The Student of Nature (1893), and his Self-Portrait (1867-1875) and Fanny Holman Hunt (1867-1868), the memorial portrait of his first wife. (The three works by Landow in th ebibliography below discuss Hunt's self-conscious interrelating of his works). Isabella similarly exists in a relationship with another work, for it represents the tragic end to a lover's tale, whereas his earlier Keatsian subject, The Eve of Saint Agnes (1849), depicts a happy ending to one. At the same time, Isabella also represents the more complex case of Hunt's pairing his work with one by another artist, in this case one by his close friend Millais, for together Isabella and the Pot of Basil and Millais's Isabella (1850) illustrate the beginning and the end of the romantic tale of tragic love that Keats adapted from Boccaccio. In addition, Isabella and the Pot of Basil, which Hunt mistakenly believed would convince critics he could paint beautiful women, relates in yet another way to the works of Millais and Rossetti, for in it he attempted to rival his PreRaphaelite brothers, each of whom had won a reputation for paintings of beautiful women. Angered by contemporary critics who praised him for his painstaking realism and earnest themes but then denigrated his art. Hunt eagerly wished to show them that he had a taste for the beautiful and the skill to create it. Both The Lady of Shalott and Isabella and the Pot of Basil illustrate works by nineteenth-century poets particularly important to the PRB, for Isabella illustrates a work by Keats while The Lady of Shalott illustrates one by Tennyson, that most Keatsian of Victorian poets. The PRB discovered Keats, who was almost unknown, and Hunt and Millais were among the first to paint subjects from his poems; but by the time Hunt executed Isabella, Keats had become a popular source for painters, and the artist may have been influenced by George Scharf's illustration to the 1854 Moxon edition of Keats (Tate, no. 138) or by earlier paintings of the subject, such as the Isabellas by William Gale (1852), W. F. D'Almaine (1853), and C. Earles (1854); see Art Journal 14 (1852): 138; 15 (1853): 172; 16 (1854): 128. The Lady of Shalott and Isabella and the Pot of Basil each depicts a woman destroyed by love, and each represents her confined within a narrow interior space shortly before her death. Furthermore, although both paintings, like the poems from which they ultimately derive, take place in eras far removed from contemporary England — Isabella and the Pot of Basil in Renaissance Italy and The Lady of Shalott in Arthurian England — neither is escapist, for each portrays universal themes with contemporary relevance. Hunt illustrates the climax of Keats's "Isabella; or, The Pot of Basil," which comes after the heroine's cruel brothers murder Lorenzo, the poor clerk whom she loves. 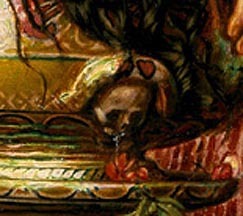 Discovering in a vision where they have buried her beloved's body, Isabella removes Lorenzo's head from the corpse and hides it in a pot of basil, which thenbecomes a gruesome shrine of love. Puzzling why their sister "sat drooping by the basil green,/ And why it flourished, as by magic touch," the brothers steal the pot of basil and, after discovering Lorenzo's head, flee to avoid arrest for his murder. Deprived of her basil, the insane Isabella dies. Hunt's painting specifically illustrates the fifty-third stanza, which relates how the young woman withdraws from life and lives only to water the plant with her tears. Perhaps the most interesting similarity between the two works lies in the fact that each makes a personal, autobiographical statement. Hunt, who frequently made covert references to his own life in his major works, found that Isabella and the Pot of Basil, which he began before his wife's death in Florence, took on new meaning after she died, for he made it both a memorial to her and a presentation of his own isolated, hopeless state as a mourning lover. After his wife's death this work "became not only a celebration of the love Hunt had experienced during his year-long marriage, in the sensuality of the figure of Isabella, but also an expression of his bereavement" (Tate, no. 138). One may also add that since Fanny had died during the couple's interrupted voyage to the Middle East where Hunt was returning to paint, he understood his bereavement as another sacrifice for art. The Lady of Shalott, which embodies Hunt's personal credo as an artist, similarly presents the conviction, so often expressed in letters, that the artist suffers, often in isolation, to create major work. Provenance: Ernest Gambart; L. Pocock; John Taylor Johnson; Mary Garrett; by descent to M. Cary Thomas; by descent to Bryn Mawr College; Delaware Art Museum. Bennett, Mary. "Footnotes to the William Holman Hunt Exhibition," Liverpool Bulletin 13 (1968Ñ1970): 38-41. Cracroft, Bernard. "Mr. Holman Hunt's 'Isabel,'" Fortnightly Review 9 (June 1968): 648Ñ57. 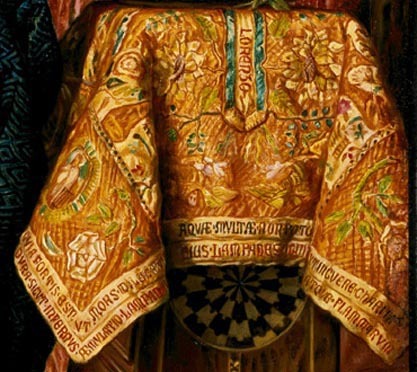 Landow, George P. "Shadows Cast by The Light of the World: William Holman Hunt's Religious Paintings, 1893-1905." The Art Bulletin, 64 (1982), 646-55. Landow, George P. Replete with Meaning: William Holman Hunt and Typological Symbolism. New Haven and London: Yale University Press, 1979. 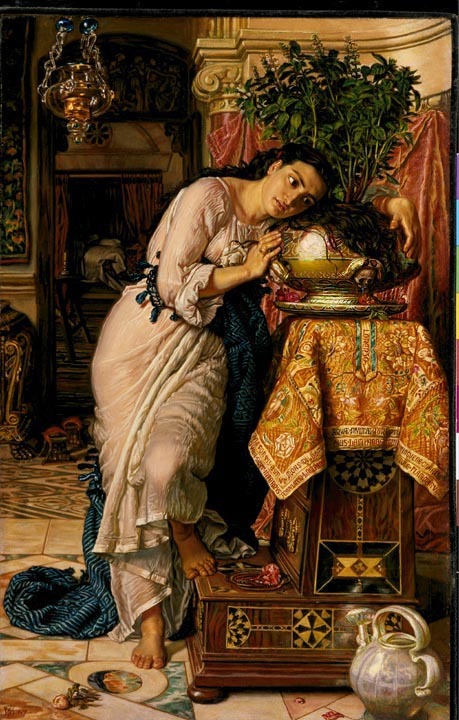 Landow, George P. "William Holman Hunt's 'Oriental Mania' and His Uffizi Self-Portrait"." The Art Bulletin 64 (1982), 646-55. Maas, Jeremy. Gambart: Prince of the Victorian Art World. London: Barrie and Jenkins, 1975. The Pre-Raphaelites. London: Tate Gallery/Allan Lane, 1984. Stephens, F. G. William Holmnan Hunt and His Works. London: Gambart, 1860. Victorian Engraving. London: Victoria and Albert Museum, 1973. Wood, Christopher. The Pre-Raphaelites. London: Seven Dials, Cassell & Co, 2000.